Aerobic exercise is performed by moving your limbs in a repetitive manner for an extended period of time. This in turn strengthens your heart and lungs, reduces your disease risk, and also improves your mood. If you're trying to add variety to your routine, consider incorporating running and jumping rope. They fall into this category and they come with similarities and differences. Weight-bearing, or load-bearing, exercise is defined as any exercise that causes gravity to push down on your body while you are on your feet. The main benefit of this exercise is it strengthens the bones and reduces the chances for osteoporosis. Both running and jumping rope are weight-bearing exercises, but running causes more impact on the joints. Caloric expenditure is important to a weight loss plan. Being that running and jumping rope are both types of cardiovascular exercise, they burn calories efficiently when you perform them. However, running has a slight advantage when it comes to the amount of calories burned. A 155-lb. person for example, burns about 372 calories jumping rope for 30 minutes. This same-sized person burns nearly 465 calories running at 7.5 mph for this same time frame. Unless you use a treadmill, a big difference between jumping rope and running is the location where they are performed. When you jump rope, your body always stays in one place. 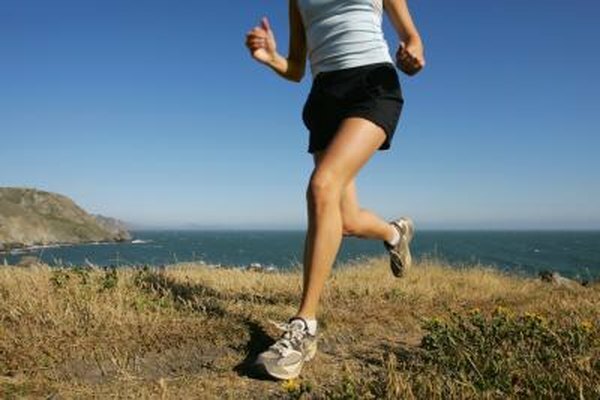 Running involves propelling your body forward on the ground. You do have the option of running in place, but you cannot jump rope around the block in your neighborhood. The equipment requirments also differs; treadmills give you the ability to do running workouts, but you can also run with no equipment at all. Jumping rope on the other hand, requires a rope. Running and jumping rope both recruit a high amount of muscles throughout the body. Being that you perform more pronounced bending of your knees and hips with running, you tax your glutes, quadriceps and hamstrings with more emphasis than jumping rope. However, jumping rope causes more emphasis on the calves. This is due to the constant bouncing up and down on your toes. When you point your toes down, you perform plantar flexion, which isolates your calf muscles. You also work more upper body muscles -- such as the deltoids, latissimus dorsi, rhomboids, pectorals and biceps -- when jumping rope. The delts are on the outside of the shoulders, the lats and rhomboids are in the upper back, and the pecs are in the chest. If you use a weighted rope, the emphasis on your muscles will be even greater. Both running and jumping rope also cause you to work your abs to maintain good posture and to produce force.